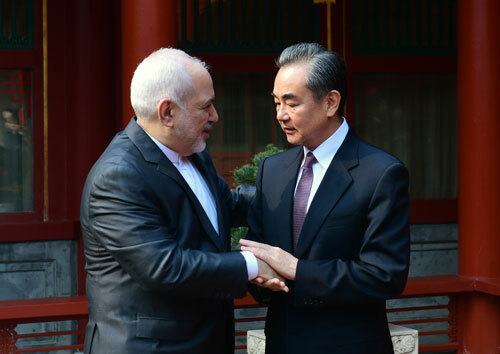 On February 19, 2019, State Councilor and Foreign Minister Wang Yi met in Beijing with Foreign Minister Mohammad Javad Zarif of Iran, who was accompanying Speaker Ali Larijani on his visit to China. Wang Yi said that the current situation in the Middle East and the current international situation are undergoing major changes, and China-Iran relations are also facing new situations. The Chinese side values and expects a more constructive role played by Iran in regional affairs. Wang Yi said that both China and Iran are countries with thousands of years of civilization and tradition, and we can maintain strategic focus, safeguard and develop China-Iran cooperation with a long-term perspective and constantly inject new connotations into the comprehensive strategic partnership between the two countries in the face of any single event at a particular time. Mohammad Javad Zarif said that the Iranian side highly values the Iran-China comprehensive strategic partnership, regards China as an important and all-round cooperative partner of Iran. He hopes to push Iran-China relations to a new starting point through Speaker Ali Larijani's visit. The Belt and Road Initiative is of special and important significance to both Iran and China, and the Iranian side is ready to actively participate in the process of jointly building the Belt and Road Initiative. The Iranian side welcomes the Chinese side to play a more important role in the Middle East affairs including the reconstruction in Syria and Iraq as well as the peace process in Afghanistan. The two sides exchanged views on the Joint Comprehensive Plan of Action (JCPOA) on the Iranian nuclear issue and expressed that they will continue to strengthen communication and coordination and make positive efforts to safeguard their legitimate rights and interests, implement the JCPOA and uphold multilateral rules.